The term celadon is a western one, derived from the name of a shepherd boy in a 17th century French play whose costume was of the luscious grey-green colour associated with this word. Celadons vary enormously in their hues, shapes and bodies and were produced at various kilns around China. 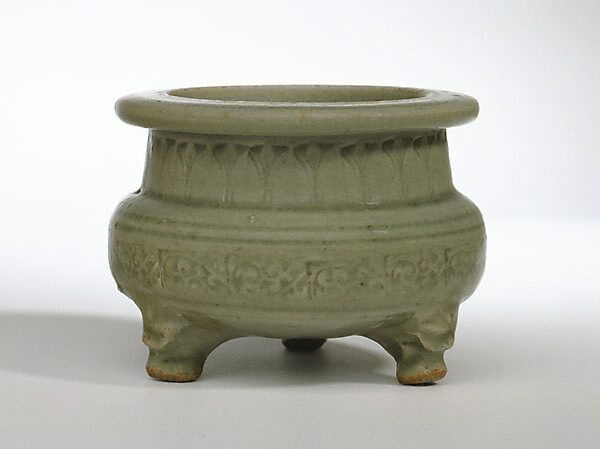 While the West is generally more familiar with the Longquan celadons produced at southern kilns in Zhejiang province, because they were widely exported, there were earlier kilns in Northern China that produced quality celadon wares. In the Northern Song dynasty (960-1127) when the Imperial court still resided at Kaifeng before invading foreigners forced it to flee south to Hangzhou, it patronised the northern celadon kilns. One group of kilns, located north of Xian in Shaanxi province emerged as the producers of wares of the highest quality. These kilns were known after the Song name of their region which was Yaozhou. This celadon censer is a rare example of northern celadon. Its colour, admired by poets as 'mysterious' (mi), and its carved decoration are characteristic of northern celadons. Its shape is based on an archaic bronze prototype, a popular tradition in China where the ruling classes had always maintained a deep veneration for the ritual bronzes of the Shang dynasty (1600 - 1027 BCE). Censers were commonly found on the desk of a Chinese scholar for the smell of incense was appreciated for its ability to heighten one's poetic sensibility, one's writing skills and one's ardour. Asian Art Department, AGNSW, February 1990. Jackie Menzies, AGNSW Collections , 'Asian Art - India, South-East Asia, China, Tibet, Korea, Japan', pg. 173-228, Sydney, 1994, 195 (colour illus.). Asian Collection Handbook, Art Gallery of New South Wales , Sydney, 1990, 27 (colour illus.) 'Early Chinese Art' by Jackie Menzies, pg. 18-29.. The Asian Collections Art Gallery of New South Wales , 'Early Ceramics', Sydney, 2003, 105 (colour illus. ).